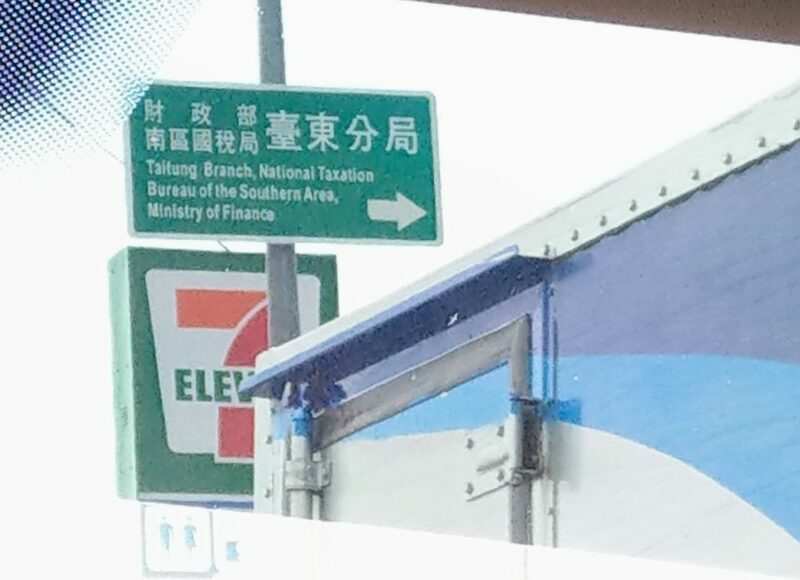 Although Taiwan has a lot of this sort of directional signage, I don’t think I’ve written before about why I think so many examples of it are downright awful. Not only is the sign unnecessarily wordy, the part that receives the greatest emphasis (by appearing in large characters) is the least useful: 臺東分局. Taidong Fenju means simply “Taitung branch office.” But since the sign is in Taitung itself, mention of an office being in Taitung provides zero useful information. (It’s a safe bet that drivers will already know which part of the country they’re in and that they aren’t driving around that neighborhood looking for the Taipei office.) The same thing goes for mention of this being the office for the Nanqu (“Southern Area”). Nor do motorists care in the least what ministry the National Taxation Bureau belongs to. They simply need to be able to comprehend quickly and easily the main point of the sign. Too much information becomes clutter, a fatal problem on signs that drivers need to be able to read and comprehend quickly and easily. A fundamental of good signage is to keep it simple. My private word for unnecessarily wordy signs in Taiwan is “signese,” which should not be confused with the good kind of Signese. Sorry about the poor quality of the photo. I had to quickly use a cell phone camera on zoom through a taxi windshield — not ideal. This entry was posted in Chinese, English, Mandarin, signage, Taiwan by Pinyin Info. Bookmark the permalink.